The DiMarzio DP175S True Velvet is a vintage-style single-coil pickup that's clean and bright. The DP175S pickup also makes your high strings sound sweet above the 12th fret. The True Velvet pickup was designed to do this by tuning the coil to a frequency range that's bright but not thin. 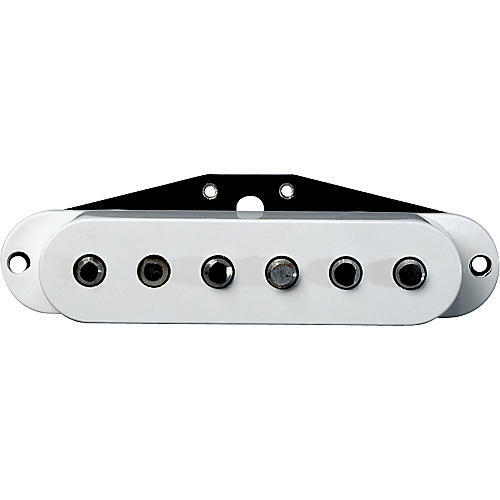 DiMarzio combined this with a magnet stagger specifically designed to enhance string balance, which produces great clarity, even with full chords. The neck and middle models of the True Velvet pickup have the same specs except for reverse wind / reverse polarity on the middle pickup for hum cancellation in the 2 and 4 positions. The bridge pickup is just a touch warmer and louder, so the transition between pickup positions is very smooth and natural. The DiMarzio DP175S True Velvet Pickup comes standard with hand-ground magnets and vintage cloth-covered wire.